A passive air sampler near three storage tanks. This article is the corrected version of last year’s study publication [*] which investigated the immissions of PAHs with passive air samplers deployed in different distances to natural gas facilities. No cancer risk due to airborne PAHs higher than the EPA’s acceptable risk levels was found. However, as the authors point out, the applied method of measuring PAHs in the air is not capable to capture all possibly present PAHs, but only the lighter part of them. Natural gas extraction, often referred to as “fracking”, has increased rapidly in the United States in recent years. 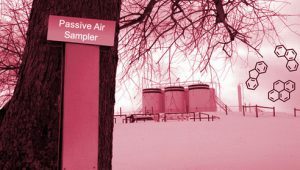 To address potential health impacts, passive air samplers were deployed in a rural community heavily affected by the natural gas boom. Samplers were analyzed for 62 polycyclic aromatic hydrocarbons (PAHs). Results were grouped based on distance from each sampler to the nearest active well. Levels of benzo[a]pyrene, phenanthrene, and carcinogenic potency of PAH mixtures were highest when samplers were closest to active wells. PAH levels closest to natural gas activity were comparable to levels previously reported in rural areas in winter. Sourcing ratios indicated that PAHs were predominantly petrogenic, suggesting that PAH levels were influenced by direct releases from the earth. Quantitative human health risk assessment estimated the excess lifetime cancer risks associated with exposure to the measured PAHs. At sites closest to active wells, the risk estimated for maximum residential exposure was 0.04 in a million, which is below the U.S. Environmental Protection Agency’s acceptable risk level. Overall, risk estimates decreased 30% when comparing results from samplers closest to active wells to those farthest from them. This work suggests that natural gas extraction is contributing PAHs to the air, at levels that would not be expected to increase cancer risk. [*] This article is a corrected form of Paulik et al., which was originally published in 2015. 30 PAH air concentrations reported in the original manuscript were incorrect. Honest calculation errors resulted from using incorrect units of the ideal gas constant and improper cell linkages in the spreadsheet that was used to adjust air concentrations for sampling temperature. The original article was retracted by the authors. This version of the article presents corrected versions of all of the original analyses and discussions.